As Madrid has historically been a crossroads, the city has many influences from all parts of Spain. Food has also been influenced by this, as you can find all kinds of regional Spanish food in Madrid. So you might ask — what is Madrid’s regional food? It does exist, of course: Cocido madrileño is Madrid’s emblematic dish. It’s a chickpea-based stew with substantial meat and vegetables. It is most popular during the winter, but is served throughout the year. You will find many tourist traps and restaurants offering this dish, so beware. You might thus ask yourself where you should go. I personally recommend Taberna La Daniela. 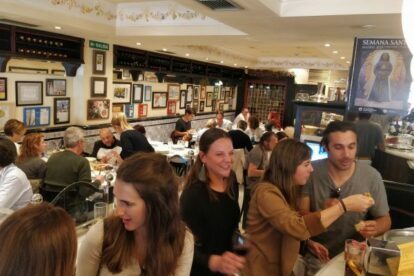 The restaurant is a well known restaurant among madrileños due to their more than two decades of history. Taberna La Daniela has been very successful with this traditional dish and many locals visit this restaurant frequently. For many, this place also represents tradition — they may go at least once a year. Taberna La Daniela is an institution for the people of Madrid. The restaurant has tried to maintain this traditional feeling since 1992. They’ve been so popular they already have four restaurants in Madrid: you can find them in Goya, cuchilleros (Plaza Mayor), Medinacelli (Huertas) or beside the stadium Santiago Bernabeu. Therefore, you have no excuse not to go. Apart from Cocido, I personally recommend ordering ropa vieja and their tender tortilla de patata. Que aproveche!